Rames sparsely villous; internode hairs about as long as, but not obscuring, the sessile spikelets. Lower glumes of sessile spikelets scabrous, often with 2 conspicuous veins between the keels. Miss., N.J., Ala., Ark., D.C, Del., Fla., Ga., Ill., Ind., Kans., Ky., La., Md., Mo., N.C., Okla., S.C., Tenn., Tex., Va.
Andropogon ternarius var. ternarius grows in dry, sandy woods, fields, openings, and roadsides of the southeastern United States and Mexico. 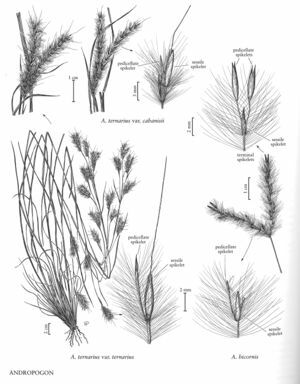 Facts about "Andropogon ternarius var. ternarius"